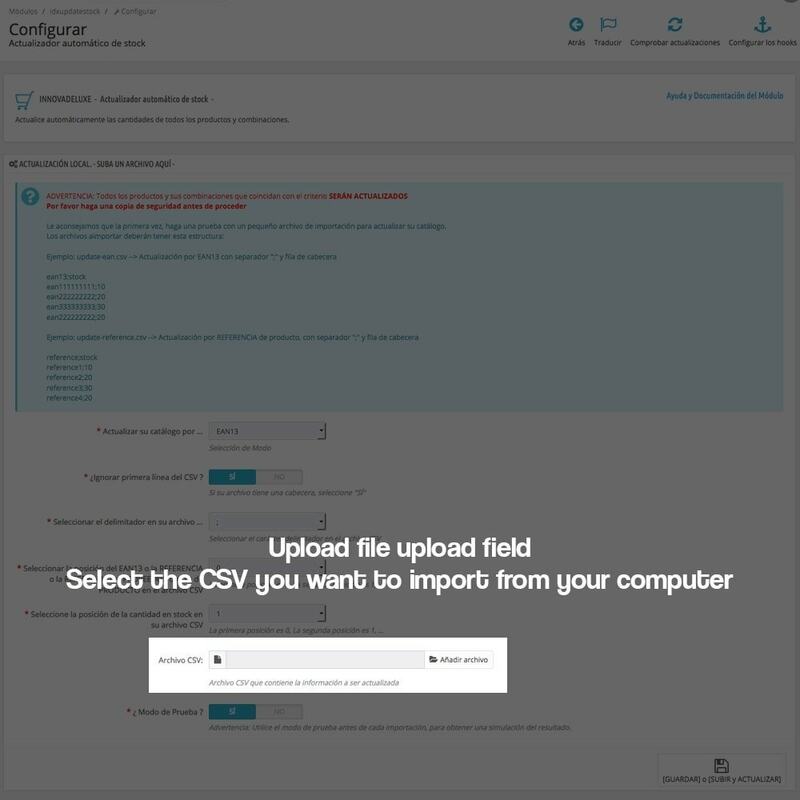 Complete module for the stock updates of a product and his combinations from a CSV file, being able to automate the updates through cron tasks of the server. 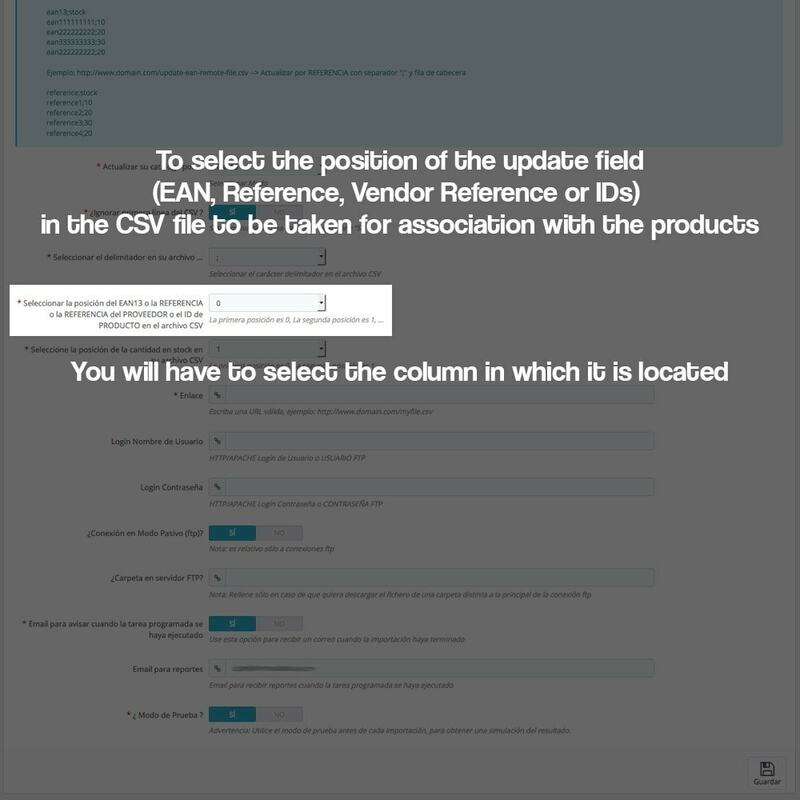 Update the stock of your product suppliers (dropshipping). 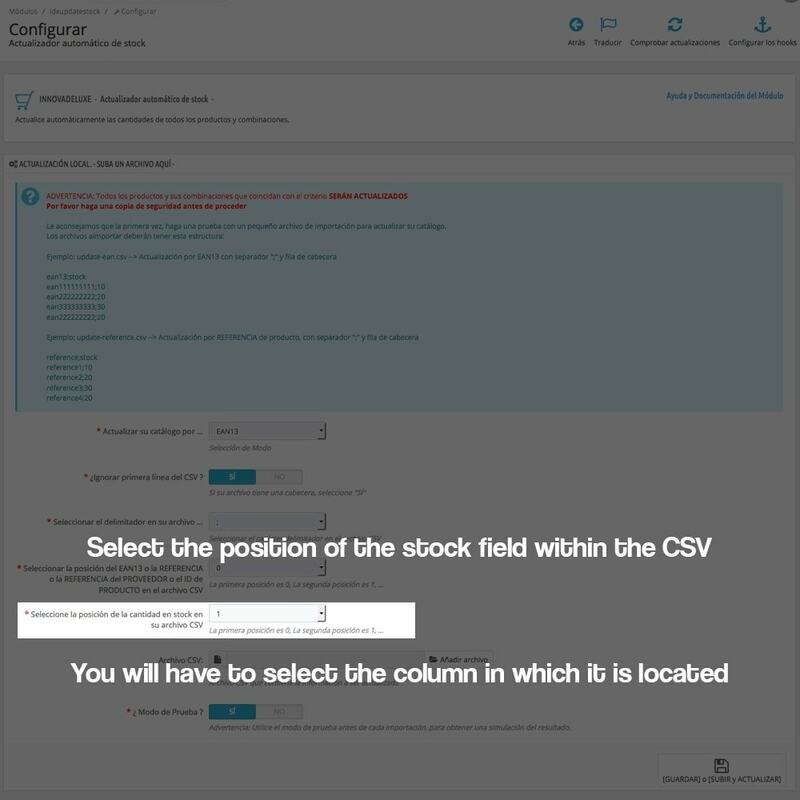 With this module to update stocks of products and combinations in a massive and automated way, you can have the stock of your store always updated. 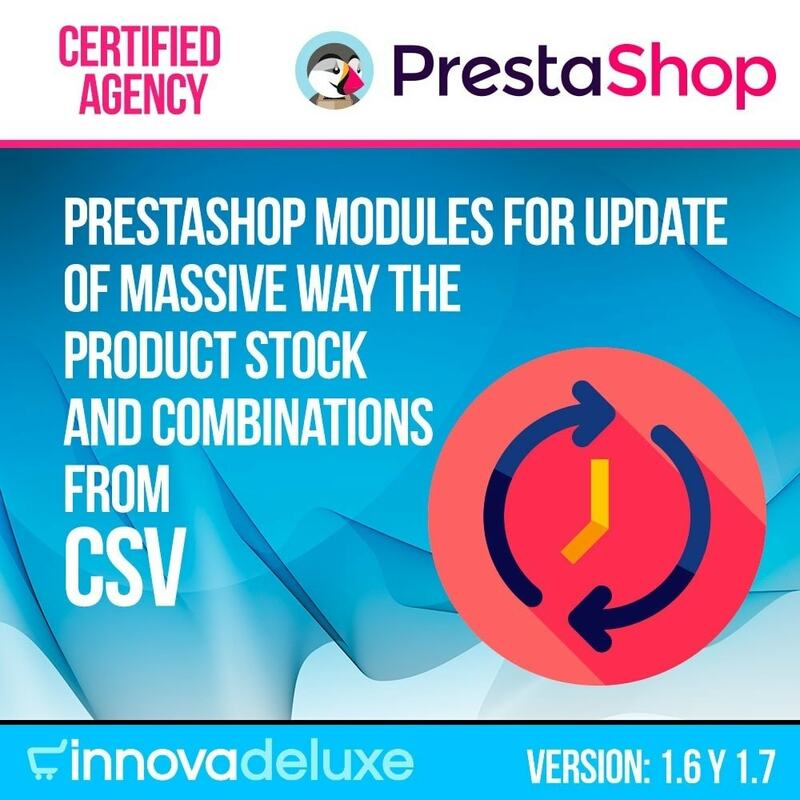 With this module you can save tens of hours by adjusting the stock of your store manually, which has an impact on your company in a huge money saving in labour. 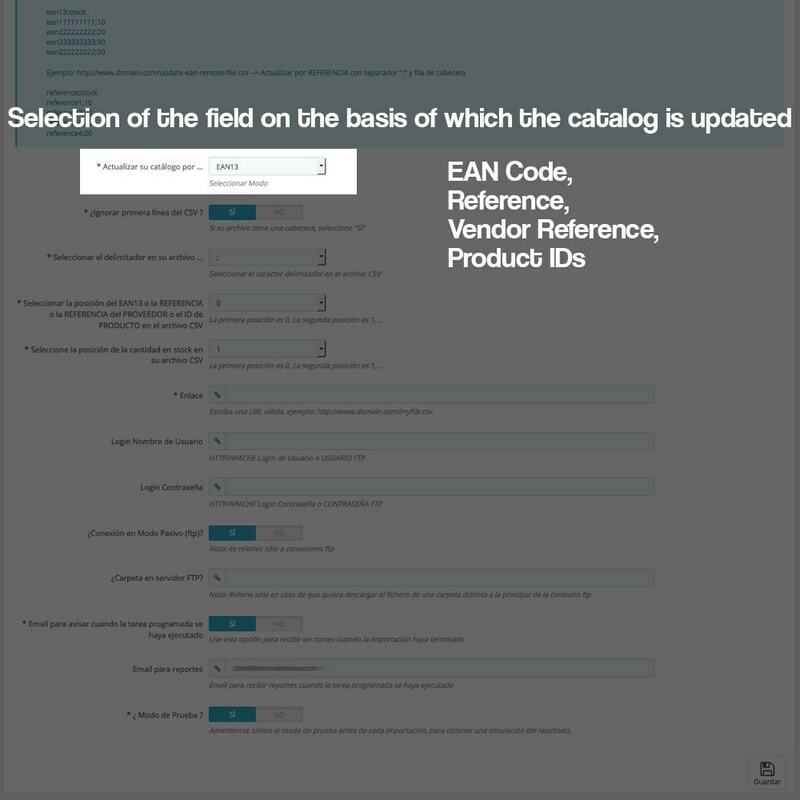 Field to look for to carry out the stock update (you can search for: ean13, reference, reference, supplier and product IDs). 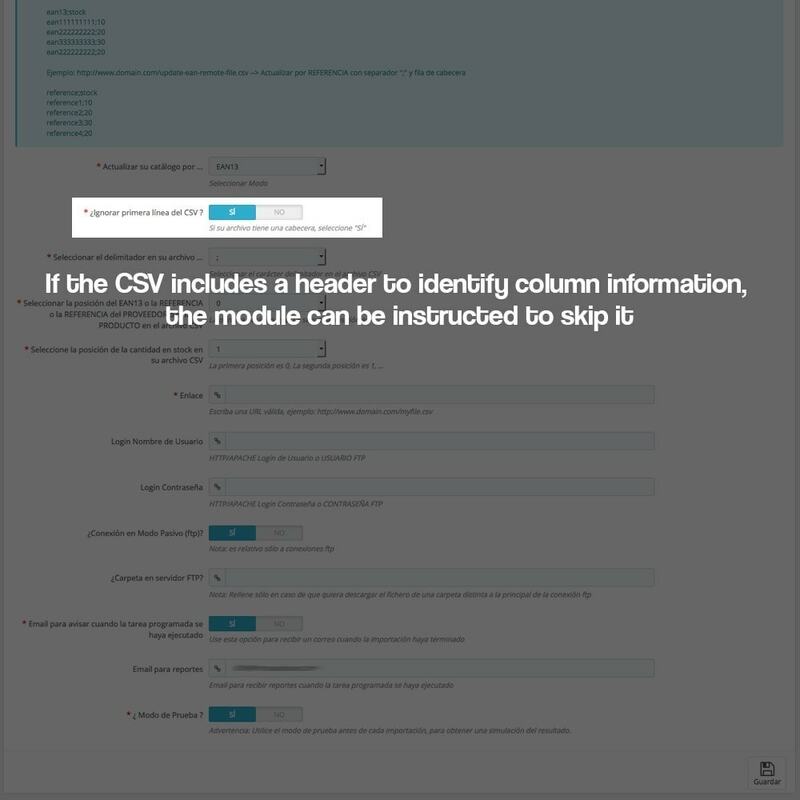 You can configure if the csv file to be uploaded includes or not informative header to skip it in the update. 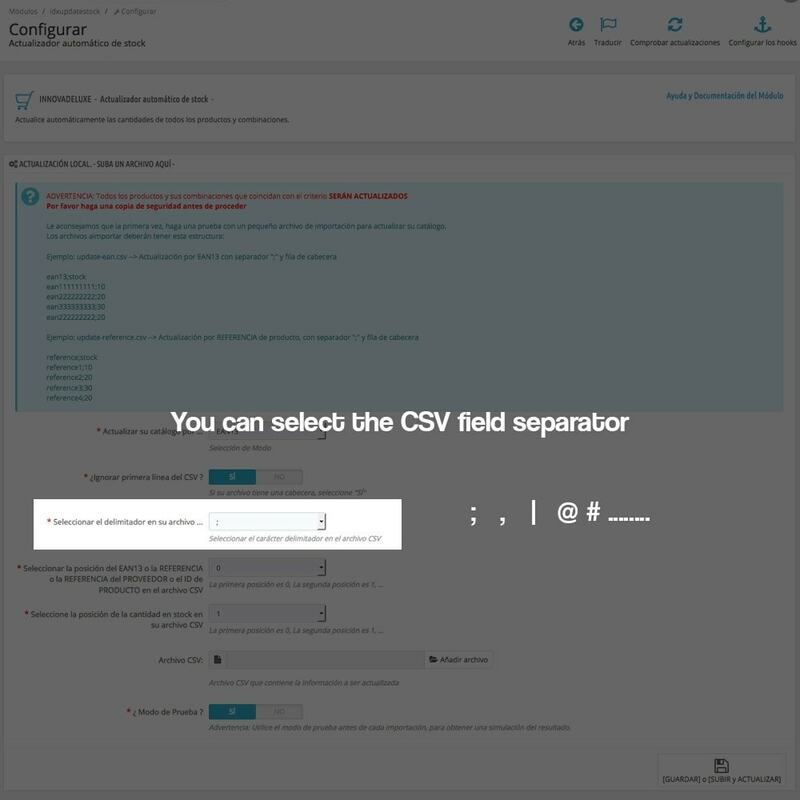 You can choose the delimiter of the csv file for separating the fields (semicolon, commas, ^, #, @, |). 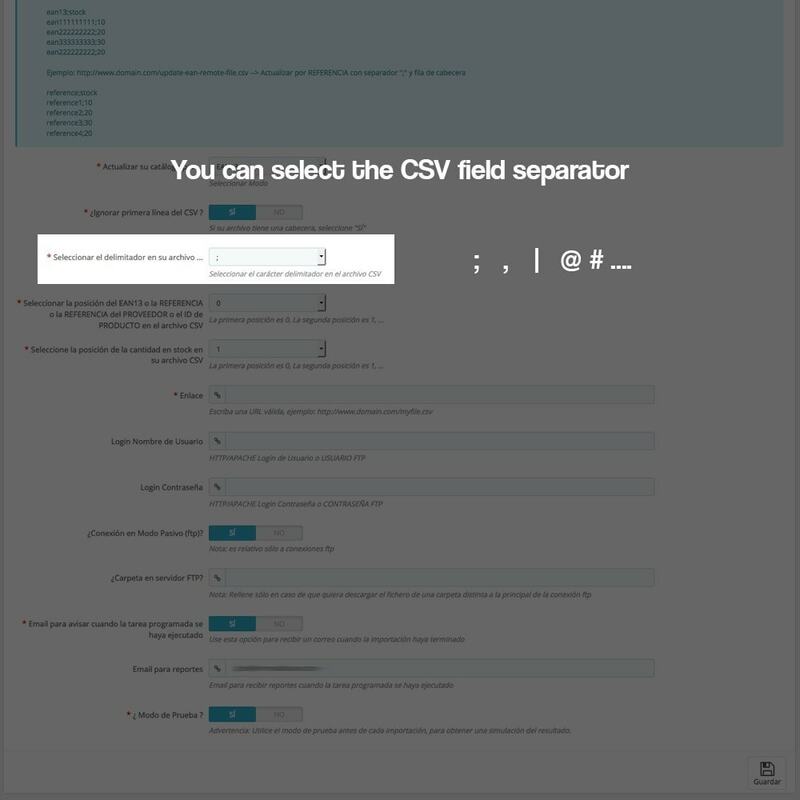 You can select the position in the csv file where the field to search will come from (ie where the ean13 field to search, or the reference, etc …). 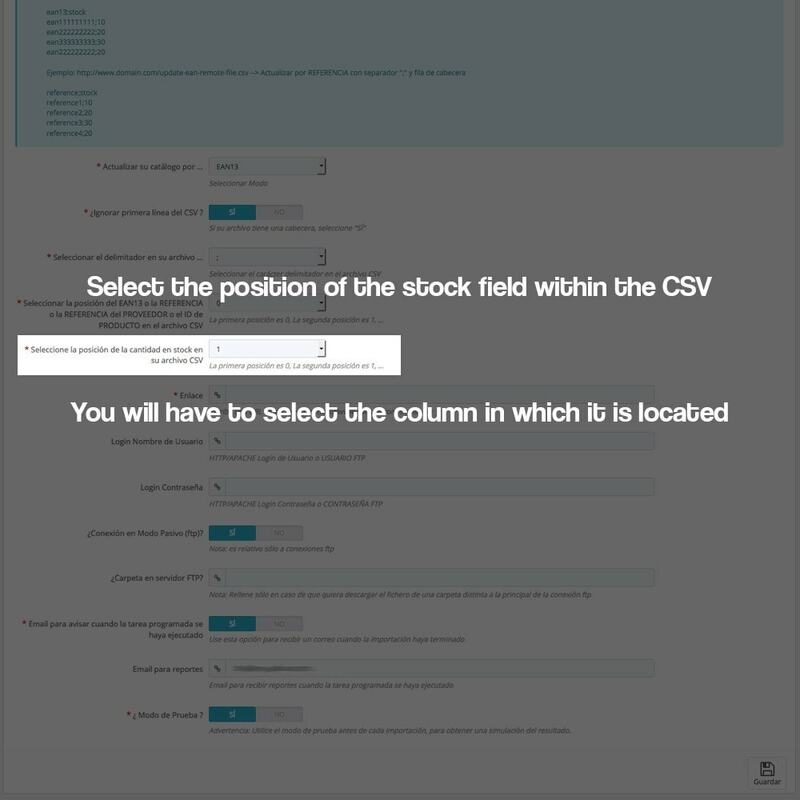 You can select the position in the csv file where the field of stock to apply in the update will come. 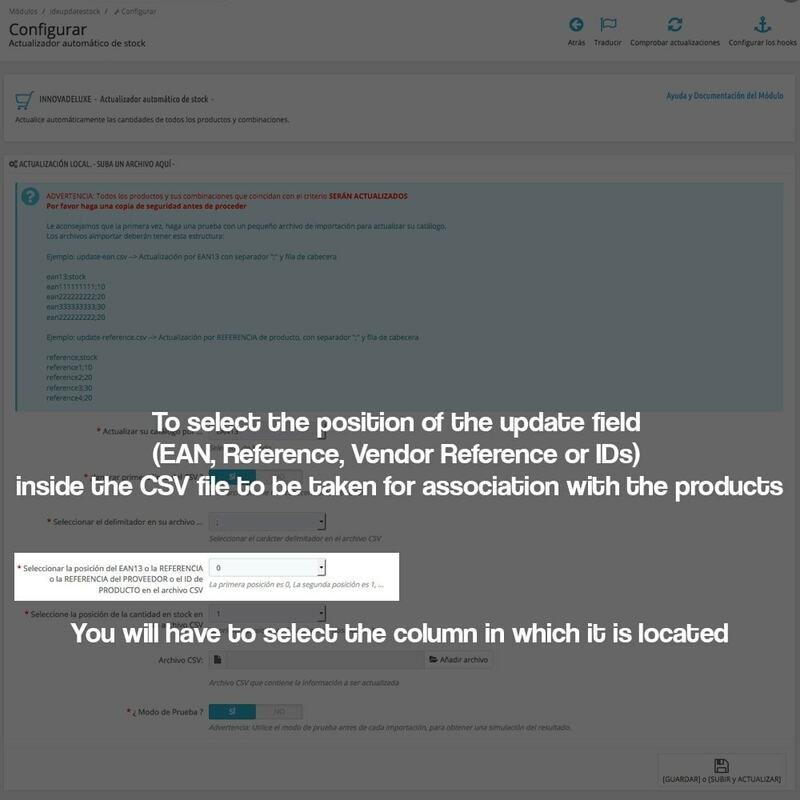 You can choose a test mode so that the results will not be applied to the database but you will see the results of how the update would have been, once you have verified that everything is correct, you can run the update. 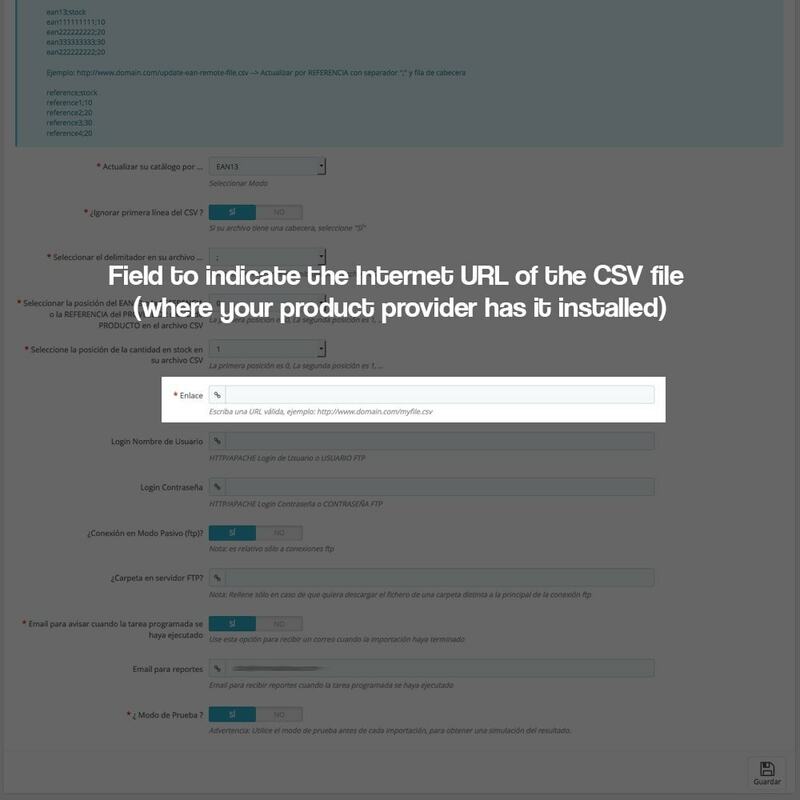 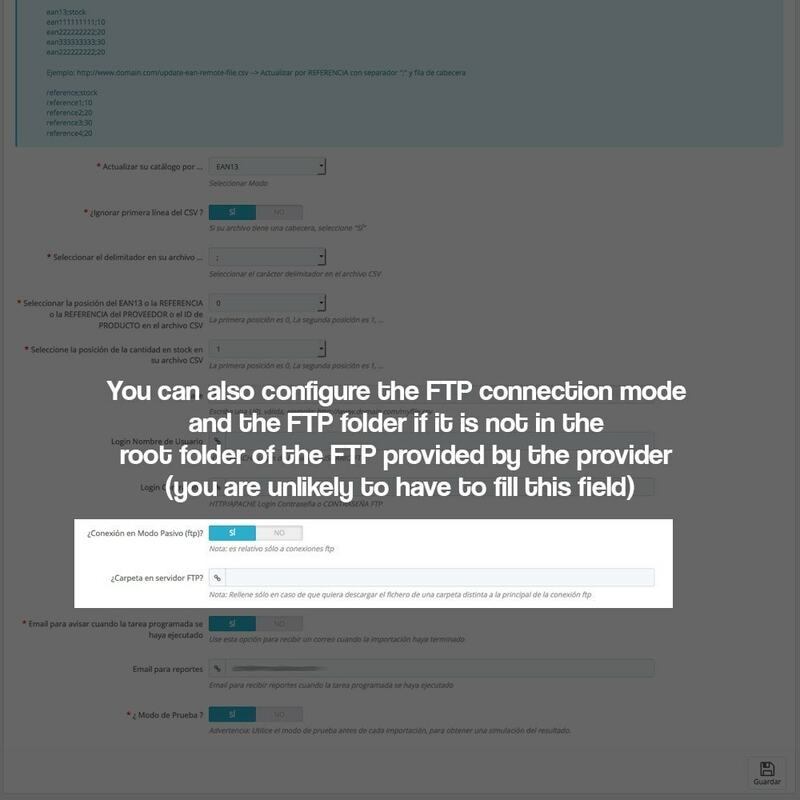 You can specify the http address where to download the file (if the web has user and password can also be configured), in the same box you can also configure ftp addresses from where to download the file (BUT the csv file must be in the folder Connection, if you have to connect and enter different folders is not contemplated ... this would be rare because csv providers leave a direct FTP). 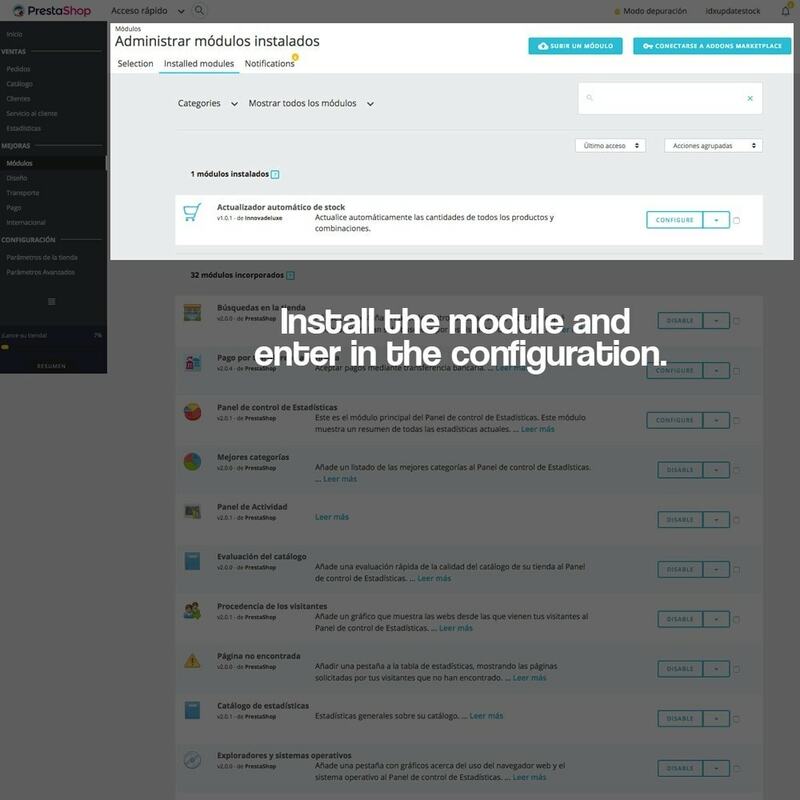 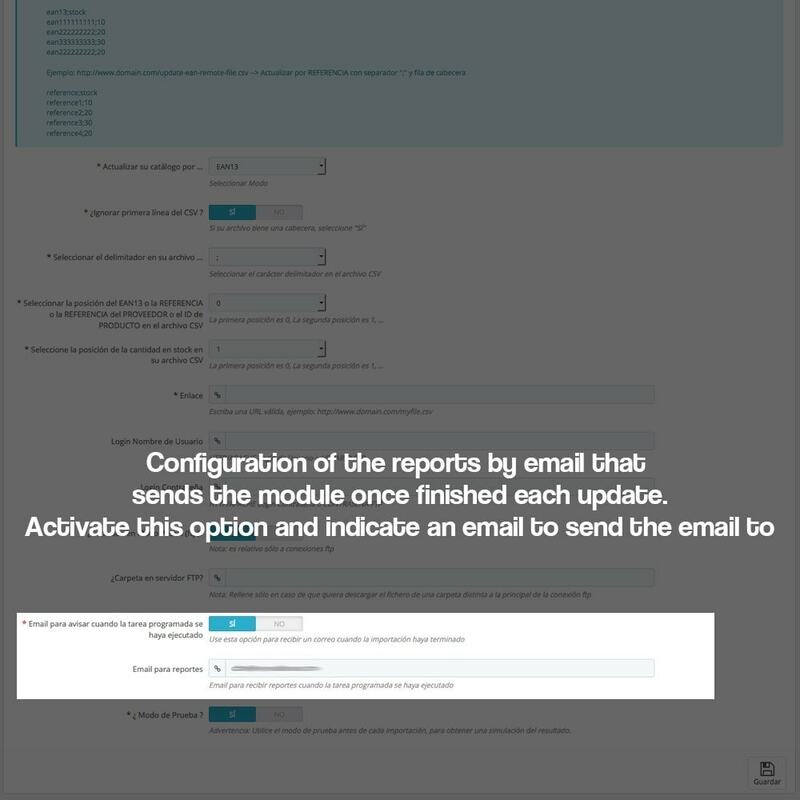 The remote mode allows you to configure if you want to receive emails with the configured process log. 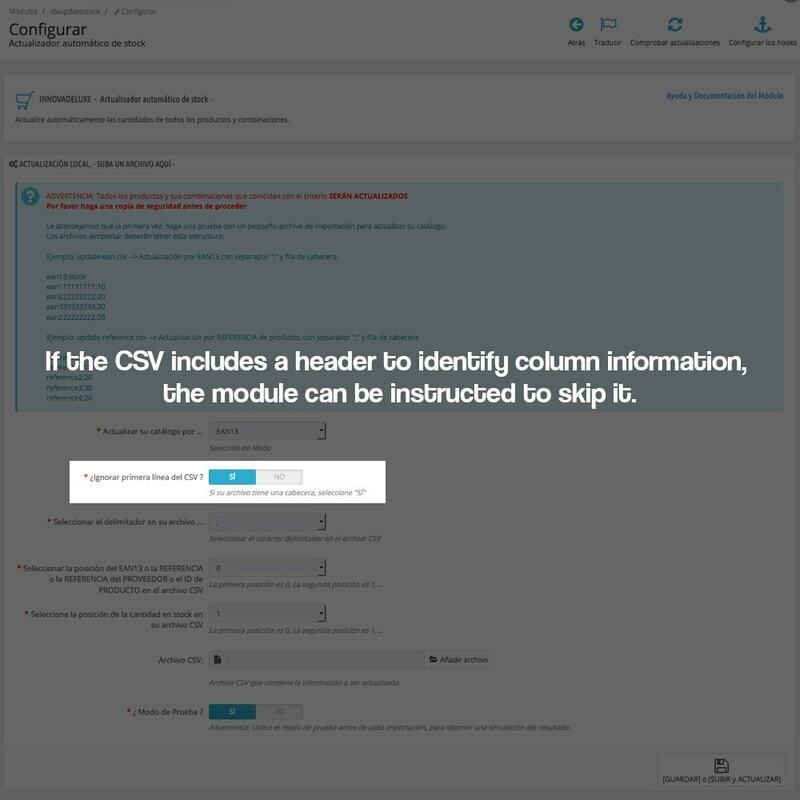 Mail that by default is of the super-administrator of the store. 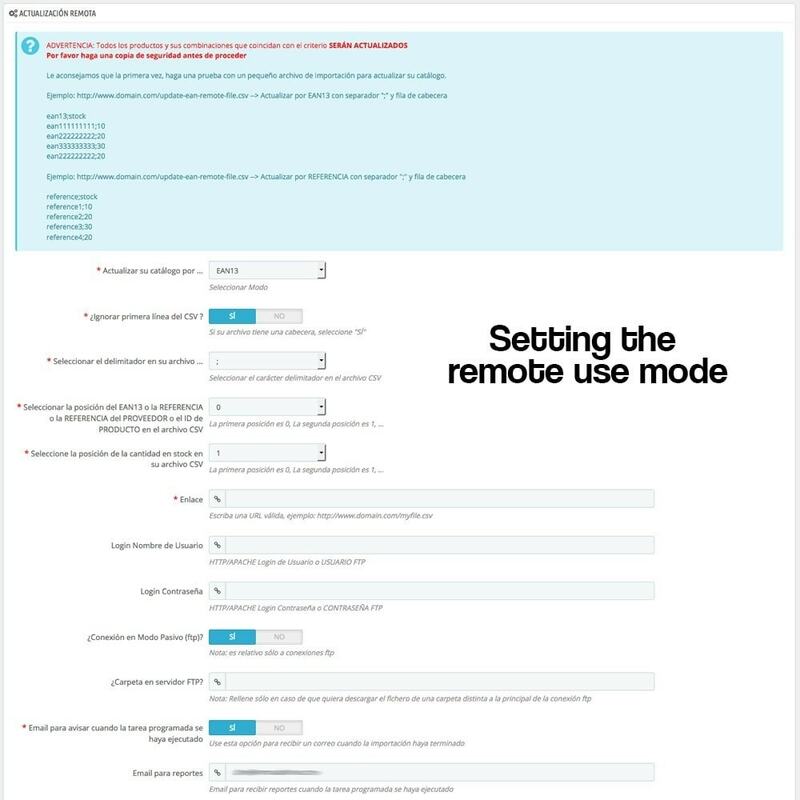 The remote mode once the connection data for the csv download has been saved, allows to automate in a programmed way by a cron task. 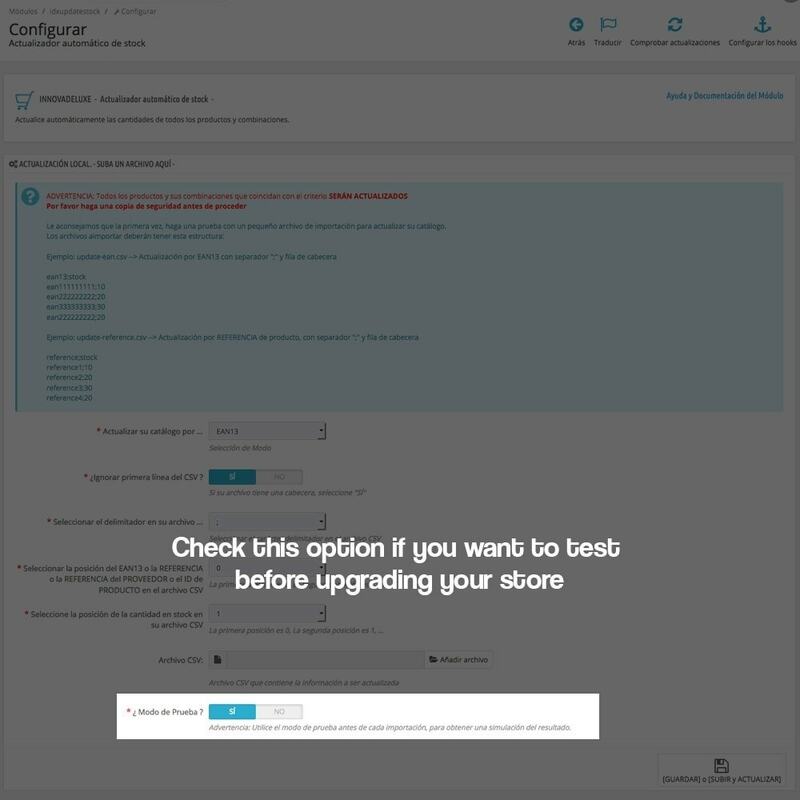 Your customers will be able to buy in your store without fear that later they will not be delivered the merchandise for lack of product as the outdated stock. 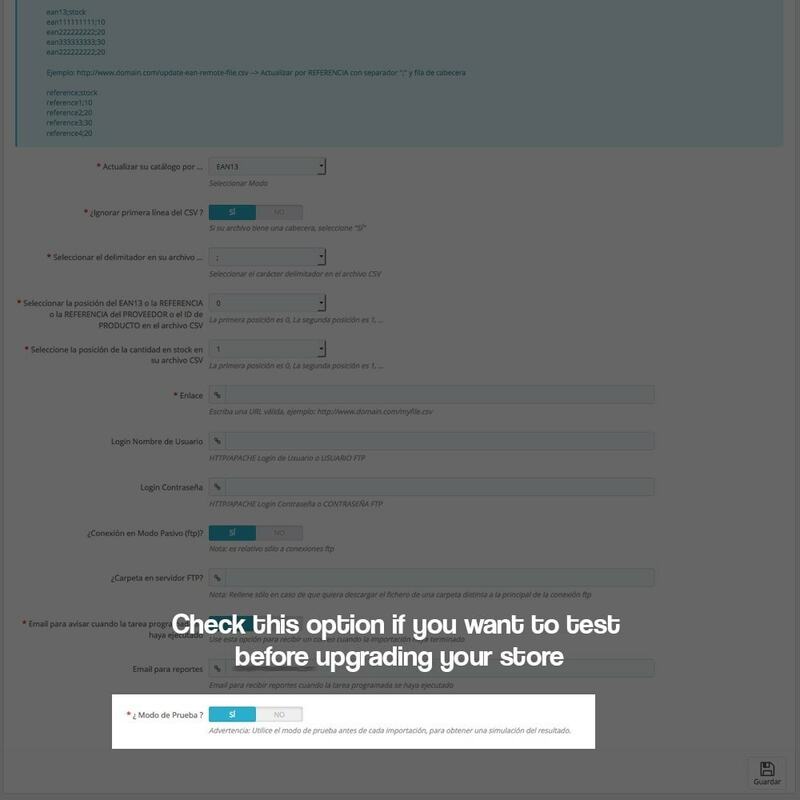 You can advertise real stock in your store, which will give you greater credibility to your customers. 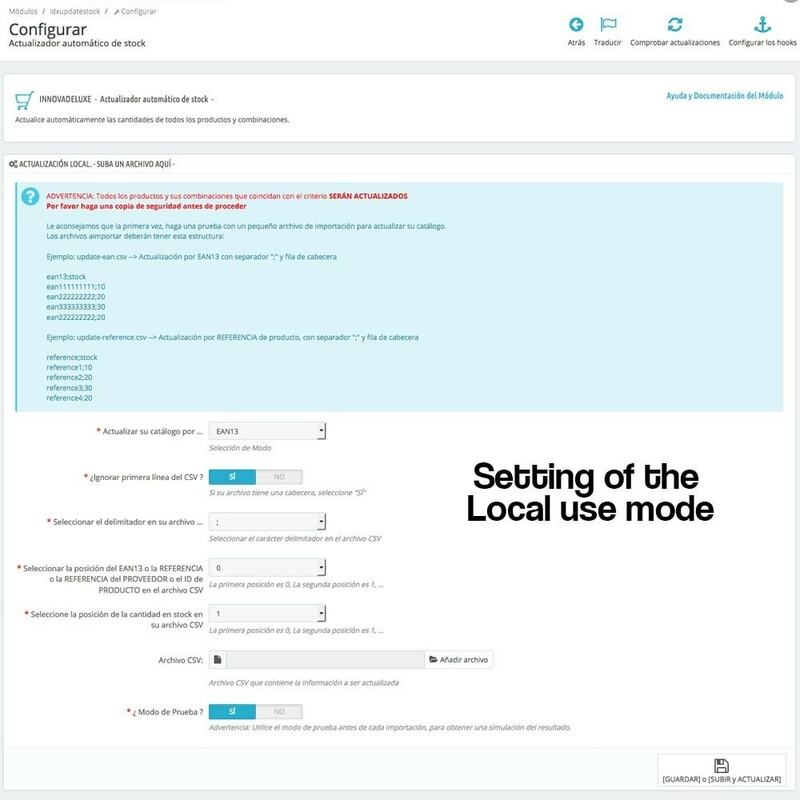 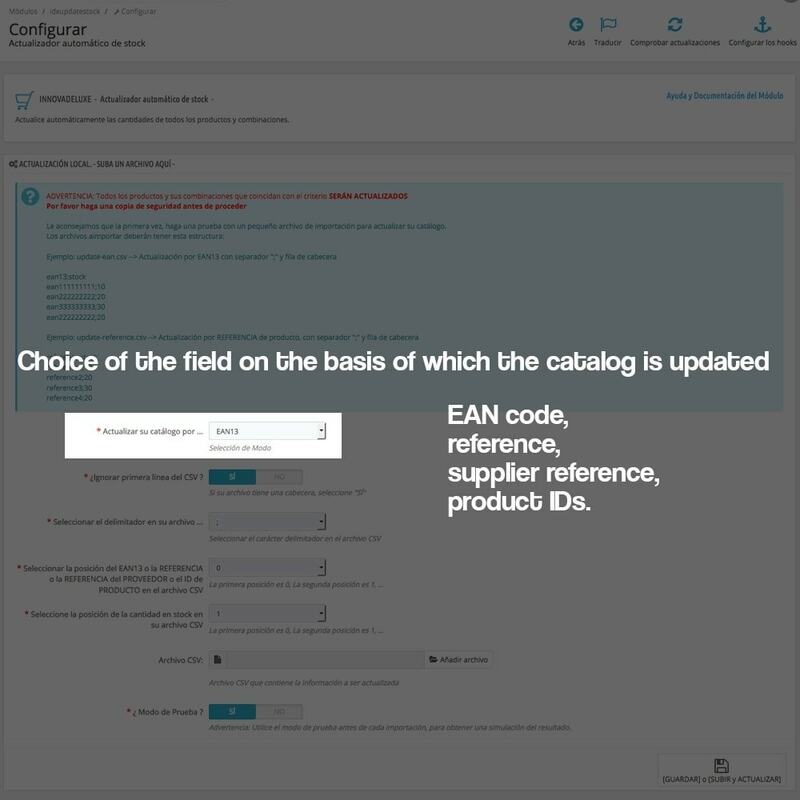 An ean13 field, or reference or supplier reference may exist on more than one product and in more than one combination if the store administrator would like, this module will change the stock on ALL those products and combinations. 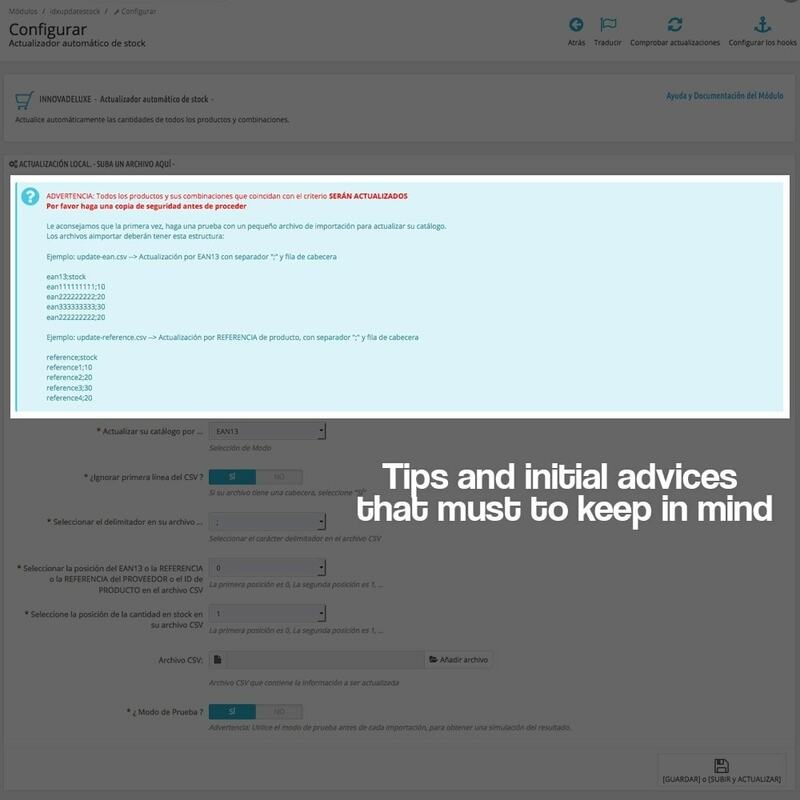 make a backup of the database before performing the updates. 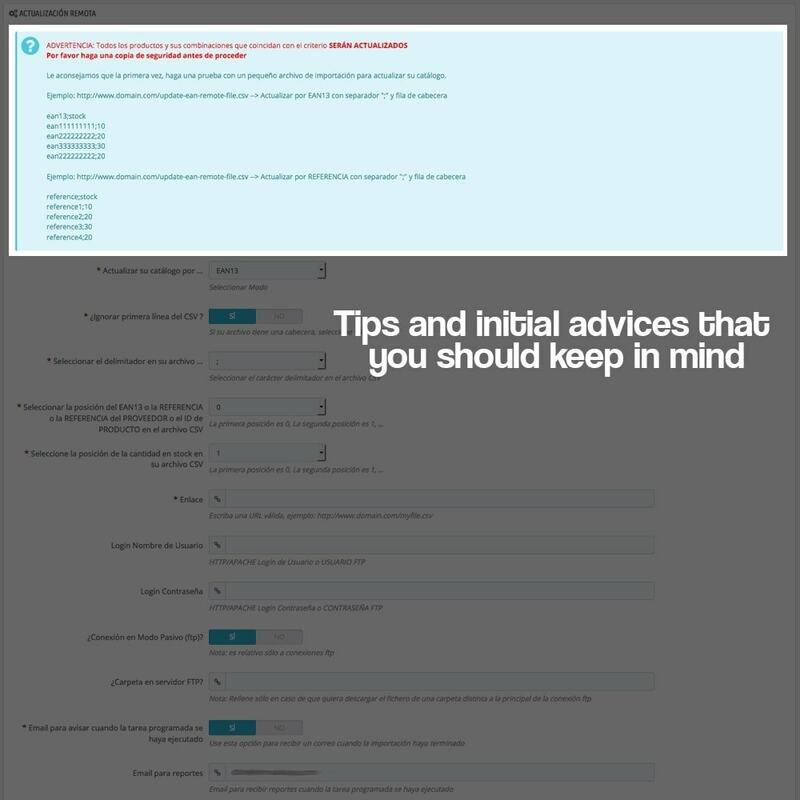 always try with small files to check that everything works before making a massive update. 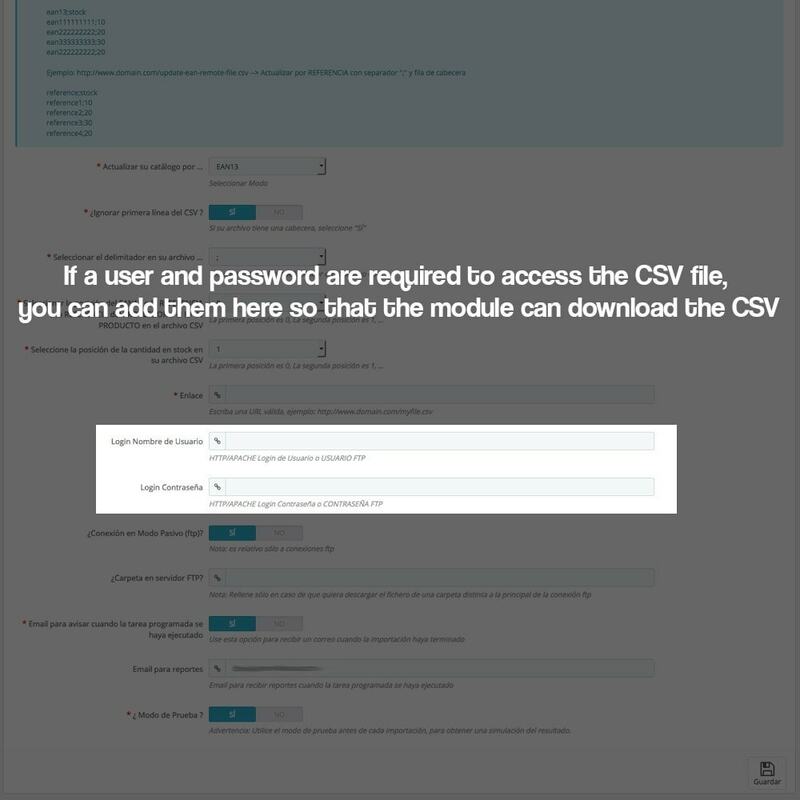 Remember that you can choose a "test" mode so that the results will not be applied in the database but you will see the results that will be obtained, so you can test and later apply if everything went correctly.